That Was Then… Marantz CD-63 review | What Hi-Fi? Anything that forces us to put “zilch” in the ‘Against’ column has to be special. 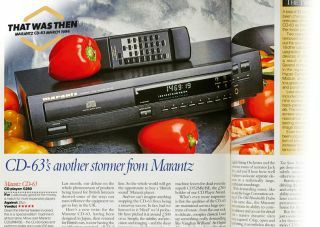 It wasn’t the first great CD player Marantz had made – the company had already cemented its place as the finest manufacturer of affordable players on the market. Indeed, it then seemed capable of resetting performance standards at affordable levels more or less at will. The £250 CD-63 followed in the footsteps of the legendary CD-52, and stomped all over it. At a cheaper price. This player also solidified the brand’s reputation as expert tweakers. The company’s engineers could take a good standard product and turn it into a superstar with a sprinkling of electronic magic dust. Things such as upgraded capacitors, revised power supplies and improved casework – down to the types of screws and feet used – may seem minor, but they gave enough incremental improvements to lift performance significantly. The arrival of the CD6006 shows Marantz has lost none of its touch in the intervening decades. The new player doesn’t appear have changed much from its Award-winning predecessor, but it’s still a class leader – as you can see in our review.